Belle Couture, the high-priced half sister to Black Caviar, collected her first career win in the $25,000 Elvis ‘Ricky’ Thurgood 34th Anniversary Plate over 1200m at Caulfield yesterday. The $2.6 million three-year-old filly jumped evenly but was right off the pace, eased back early by jockey Damien Oliver. Belle Couture, $2.70 favourite, found herself 10th at 400 metres before she let down with a great turn of foot, to pull together a strong finish and win by two-and-a-quarter lengths to the Bob Keirl-trained Knockout Johnny ($81), with the Ciaron Maher-trained Barkley Boy ($5.50) a half-neck away in third. Trainer Danny O’Brien said the win was one of the most important maidens of his career. "Damien (Oliver) in her last trial did ride her pretty cold and he thought that she ran on super in that way," O’Brien said. "When we got that draw I didn’t give him any instruction, he just told me what he was going to do and I was more than happy with that, especially when it worked out." O’Brien said the filly was “improving all the time” and he was excited to see her win so early on in her career, given the amount of attention Belle Couture had claimed. "She’s been a big doey sort of filly and now she’s a lot more athletic and she’s getting there as a racehorse," he said. "She’s coming on in leaps and bounds and she’s made a huge progression from her first-up run three or four months ago, I put her away and she has come back and is turning into a really good racehorse." O’Brien said Belle Couture now had the strength to carry herself following a "few little niggles" that had stopped the trainer from pushing her too hard earlier on. "But when you see what Peter (Moody) did with her sister (Black Caviar) and how patient he was, it was pretty easy for us to be patient with her and hopefully there’s plenty left in front of her," the trainer said. He said the filly would have more runs this campaign and could look at increasing the distance. "Every time we run her we’re going to find out about her, so I certainly don’t think (that 1400 or 1600 metres is ) beyond her, obviously today she’s been back and run on sprinter-style so I’ll have a chat to Damien but I’d say we’d stick at the 1200 (metres) for the next run or two anyway," he said. "It’s a good time to hopefully learn her craft a bit now over the next six weeks or so, the real tough three-year-olds have had their autumn and hopefully we can put a couple of races together and maybe have something during the spring." Jockey Damien Oliver said he was confident in Belle Couture’s run. 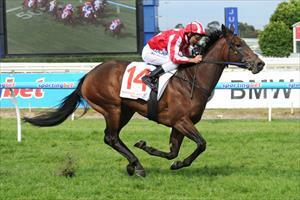 "She was travelling well and she felt like she was going to unleash with a good finish," OIiver said. "I think the bit of time and patience Danny (O’Brien) has shown has really going to pay dividends now."